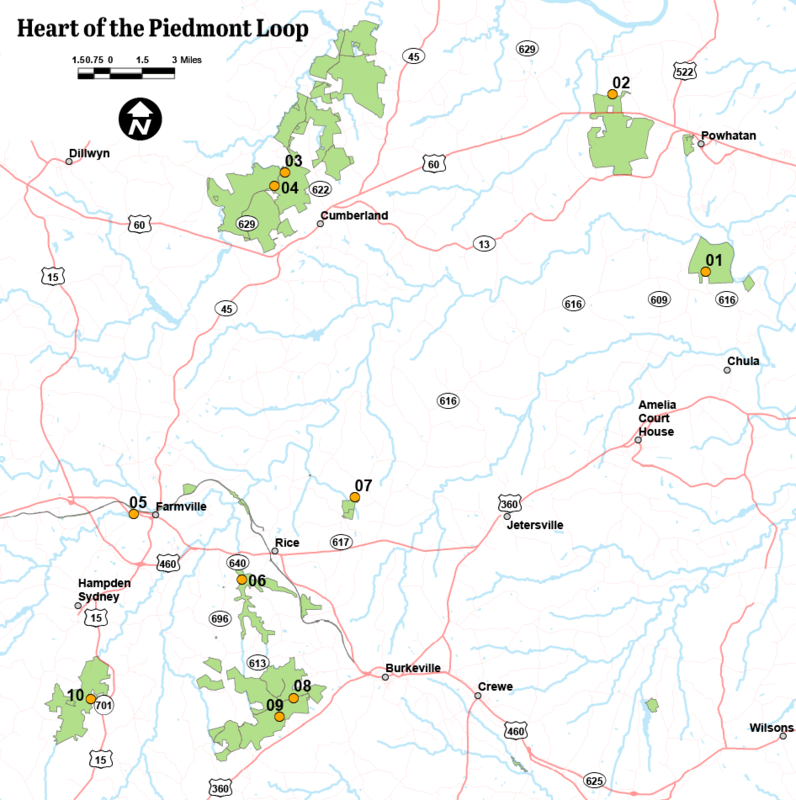 The Heart of the Piedmont Loop takes visitors into a series of state forests, state parks, and wildlife management areas with large tracts of deciduous and coniferous forest to explore. It also takes you through the area of the last major Civil War battle in Virginia at Sailor’s Creek. After losing 7,700 men and 8 generals, Robert E. Lee made his way to Appomattox where he surrendered to Ulysses S. Grant and reunited the nation. As you travel this loop, watch not only for barred owls quietly surveying you from the canopy, but listen for the sounds of battles fought long ago. The winter months bring flocks of tiny songbirds continually passing by in waves of dark-eyed juncos, golden-crowned kinglets and brown creepers. The open fields of Sailor’s Creek Battlefield provide a refreshing contrast to the closed canopy of the forests, while the other woodlands are interspersed by a number of small reservoirs that consistently add a new dimension of wildlife watching. The Sandy River Reservoir and Briery Lake complement smaller water bodies along this loop providing greater opportunities to see wildlife and remember the end of a dark period in our nation’s history.